Does OT Actually Increase Trusting Behavior? It’s the holiday season, when many people try to clear a little mental space for thoughts about peace on earth and good will toward humanity. In this spirit, I thought I’d inaugurate this blog with a close look at an endocrine hormone that, according to some researchers, can promote trust, generosity, empathy, and, yes, even world peace. I’m referring, of course, to oxytocin (OT). I’ll probably write about these issues in the future, but for now I want to look closely at a much more circumscribed OT-related idea that took the scientific world by storm a few years back. This is the notion that spraying a little OT up people’s noses causes them to become more trusting toward strangers. Let’s look at the initial test of this hypothesis, as well as the evidence that emerged in the wake of the initial experiment, with the goal of estimating the strength of the evidence both for, and against, this charming idea. In the very first experiment on oxytocin’s effect on trusting behavior, which bore the definitive title “Oxytocin increases trust in humans” , Kosfeld and colleagues randomly assigned 58 healthy men to receive either OT, or an equivalent amount of placebo, via a nasal spray. After the sprays had been given a chance to “kick in” (50 minutes), participants played four rounds (each time with different partners) of the Trust Game—one of the workhorses of experimental economics. The Trust Game is a two-player game in which one player takes on the role of the Investor (these are the subjects whose oxytocin-influenced behavior matters for our purposes here), and the other takes on the role of the Trustee. The Trust Game is hard to describe succinctly, but the Kosfeld paper has a helpful illustration. The Trust Game is a two-stage game. In Stage 1, the Investor chooses how much money (in the Kosfeld experiment, either 0, 4, 8, or 12 “monetary units,” or “MU”) from a bolus 12 of MUs (which the experimenter provides) to transfer to an anonymous Trustee. (Participants are told that these MUs will be converted into real cash after the experiment ends.) The experimenters typically triple the transfer on its way to the Trustee. 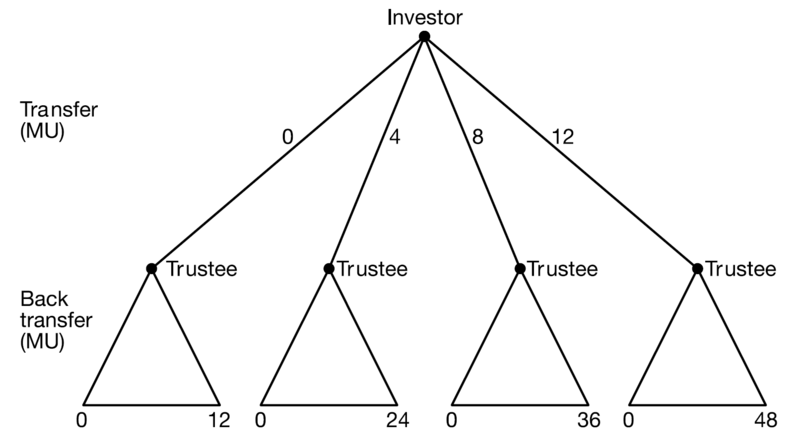 As a consequence, if the Investor sends 4 MU to the Trustee from her bolus of 12 MU (second branch from the left, marked “4”), the Trustee will finish Stage 1 with her original 12 MU, plus the additional 4 MU * 3 = 12 MU that result from the 4-MU transfer from the Investor (after the experimenters multiply that transfer by 3). In contrast, the Investor will be left with 12 – 4 = 8 MU at the end of Stage 1. In Stage 2, the Trustee is given a choice to send as much or as little of her 24 MU back to the Investor as she wishes. This is called a back-transfer. If the Trustee chooses to send 0 back, she keeps all 24 MU for herself. Anything she does sends back to the Investor gets subtracted from the Trustee’s 24 MUs, and is added to the 8 MU that remained in the Investor’s account at the end of Stage 1. The game is called the trust game under the assumption that people generally like money and prefer to have as much of it as possible. Under this assumption, it does make sense to conceptualize Investors’ choices about how much to send to their Trustees during Stage 1 as measures of their trust that the Trustees will reciprocate during Stage 2. So, the key question is this: Did OT increase Investors’ Stage 1 transfers in the Kosfeld experiment? That is, did OT increase their trusting behavior? 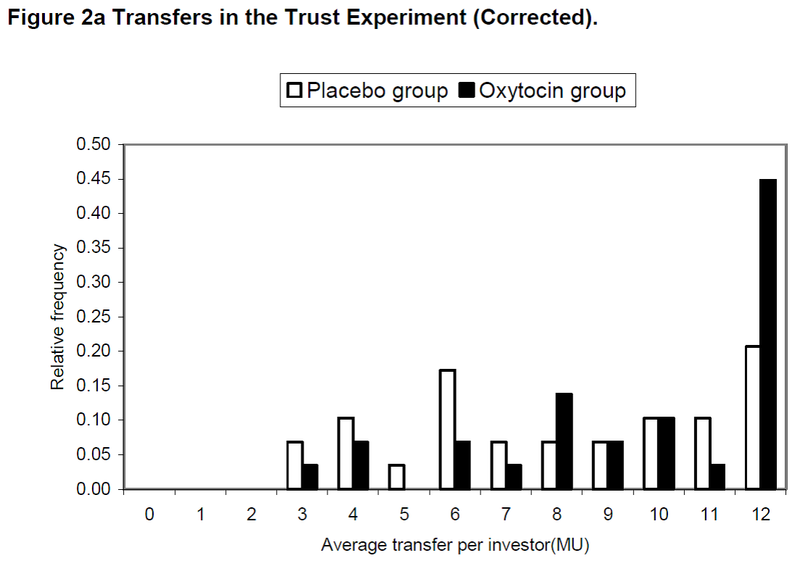 Here’s what the authors wrote: “The investors’ average transfer is 17% higher in the oxytocin group (Mann-Whitney U-test; z = -1.897, P = 0.029, one-sided), and the median transfer in the oxytocin group is 10MU, compared to a median of only 8MU for subjects in the placebo group” (p. 674). The figure below, also from the Kosfeld paper, shows the distribution of transfers for the OT group and the placebo group. Look at the far right side of the figure: The difference in the percentages of participants in the OT and placebo conditions who transferred all of their MUs (12) to their four Trustees is really quite arresting. The authors summarize this result on p. 647: “Out of the 29 subjects, 13 (45%) in the oxytocin group showed the maximal trust level [that is, they entrusted all of their MUs to their Trustees on all 4 rounds], whereas only 6 of the 29 subjects (21%) in the placebo group showed maximal trust.” Mind you, a statistical purist would likely have winced at the researchers’ use of a one-tailed statistical test—especially since the difference in the distributions for the two groups would not have registered as statistically significant at p < .05 (which signals that the results would be expected less than 5% of the time in a world in which the null hypothesis is true) with a two-tailed test. Nevertheless, just by looking at the figure you can understand why the authors got excited by their data. The Kosfeld paper has become a citation classic. Google Scholar tells me that it has been cited 1,673 times as of today (by means of comparison, Watson and Crick’s 1953 Nature paper on the structure of DNA, which has also been sort of important for science, has been cited 9,130 times). But is it correct? That is to say, are the Kosfeld findings robust enough to license the conclusion that oxytocin really does increase trust in humans? Allow me to lay out the post-Kosfeld evidence so you can make up your own mind. I have located five post-Kosfeld experiments that examined the effects of intranasal OT on trusting behavior in the trust game, and I restrict my remarks to those experiments only. (I’m ignoring studies on people’ s self-reported trust of strangers, for example, as well as a few other experiments that have used experimental games other than the trust game.) I have scored each of these five replication experiments as either a successful replication or a failure to replicate (or some admixture of success and failure). (Caveat lector: None of these studies is an exact replication of Kosfeld). Replication 1: Baumgartner et al. (2008) In 2008, Baumgartner and colleagues ran a reasonably close replication of the Kosfeld experiment, though they modified the protocol so participants could play the trust games while their brains were being scanned via fMRI. Forty-nine men, randomly assigned to receive either OT or placebo, played a series of six trust games (interleaved with six other kinds of games, which I’m ignoring) with anonymous partners. At the end of the first six trust games, Investors received the feedback that only 50% of their Trustees had made back-transfers. After this disappointing feedback, the Investors played six new trust games (interleaved with some other games) with six new anonymous partners. The figure below, from the supplemental online materials for the paper, shows the main results. As you can see on the left side of the figure, OT did not meaningfully increase trust during the first six “Pre-Feedback” rounds. Baumgartner mostly ignored those results, however, and focused instead in their discussion on the right side of the figure: In the six “Post-Feedback” Trust Games, OT participants entrusted significantly more money to their Trustees, on average, than did the placebo participants. But it seems to me that we, as dispassionate consumers, are ill-advised to discount the lack of OT-vs.-placebo differences on the Pre-Feedback rounds: I myself am going to score them as an unambiguous “failure to replicate.” Nevertheless, it’s nearly Christmas, and science would stop progressing if we were unwilling to open our minds to new ideas, so I’m happy to score the results from the post-feedback rounds as a “successful replication” of Kosfield. I am going to score Baumgartner, then, as a 50% successful replication and a 50% failure to replicate. Replication 2: Mikolajczak et al. Mikolajczak and colleagues randomly assigned 60 healthy men to either OT or placebo, and then had them play ten trust games with partners who had been described as “reliable,” and ten with partners who had been described as “unreliable” (and some other trials that aren’t directly relevant here). Men in the OT group entrusted more money, on average, to partners who had been described as “reliable” than did men in the placebo group, although there were was no OT-vs.-placebo difference in the amounts entrusted to partners who had been described as “unreliable.” The results for the “reliable” partners can be interpreted as a reasonably successful replication of Kosfeld, and a good story can be told for why the results for “unreliable” partners are not a failure to replicate Kosfeld, but I’m not sure whether we can just ignore the lack of OT effects for unreliable partners entirely. I am going to score Mikolajczak as a 75% successful replication and a 25% failure to replicate. I admit that this is a hard one to call, though, and other people of good will could come to different conclusions about how to score this study. Replications 4 and 5: Klackl et al. (2012) and Ebert et al. (2013). Only two more to go. Klackl and colleagues performed a fairly close replication of the 2008 Baumgartner paper with 40 healthy men (sans fMRI) and found that participants who received OT did not, on average, send more money to partners during six pre-feedback games, or during six post-feedback games. (This study, therefore, is not only a failure to replicate Kosfeld, but also a failure to replicate Baumgartner.) Finally, Ebert et al. found that 26 people (13 who had been diagnosed with Borderline Personality Disorder and 13 non-diagnosed controls; mostly women) were no more trusting of 20 strangers in a series of trust games following OT administration than they were following administration of a placebo (all 26 participants did OT trials on one occasion, and placebo trials on another occasion, with counterbalancing). On this basis, I’m calling Ebert, too, a 100% failure to replicate. With the relevant post-Kosfeld data favoring failures to replicate by 3:1, I think a dispassionate reader is justified in not believing that OT increases trusting behavior–at least not in the context of the trust game. Should we do a few more studies just to make sure? Fine by me, but it seems to me that we, as a field, should have some sort of stop-rule that would tell us when to turn away from this hypothesis entirely–as well, of course, as how much data in support of the hypothesis we would need to justify our acceptance of it. In addition, I’m struck by the fact that no one has ever gotten around to reporting the results of an exact replication of Kosfeld. In light of the Many Labs Projects’ recent successes in identifying experimental results that do and do not replicate, I’d personally be content to believe the results of several (five, perhaps?) large-N, coordinated, pre-registered exact replications of the Kosfeld experiment. But until then, or until new data come in that are relevant to this question, I know what I am going to believe. By the way, if you don’t like how I scored the studies, I would be curious to know how you would synthesize these results to come to your own conclusion. Also, there could be other data on this topic out there that I have failed to include. If you’ll let me know about them, I’ll get around to incorporating them here and updating my box score accordingly. 1. Kosfeld, M., et al., Oxytocin increases trust in humans. Nature, 2005. 435: p. 673-676. 2. Baumgartner, T., et al., Oxytocin shapes the neural circuitry of trust and trust adaptation in humans. Neuron, 2008. 58: p. 639-650. 3. Mikolajczak, M., et al., Oxytocin makes people trusting, not gullible. Psychological Science, 2010. 21: p. 1072-1074. 4. Barraza, J.A., The physiology of empathy: Linking oxytocin to empathic responding. 2010, Unpublished Doctoral Dissertation, Claremont Graduate University: Claremont, CA. 5. Klackl, J., et al., Who’s to blame? Oxytocin promotes nonpersonalistic attributions in response to a trust betrayal. Biological Psychology, 2012. 92: p. 387-394. 6. Ebert, A., et al., Modulation of interpersonal trust in borderline personality disorder by intranasal oxytocin and childhood trauma. Social Neuroscience, 2013. 8: p. 305-313. 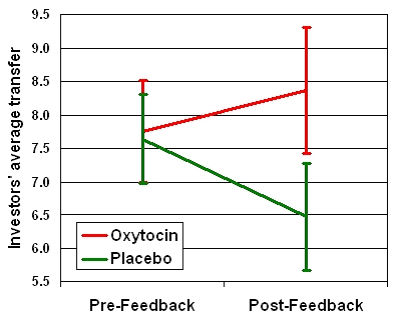 The Trouble with Oxytocin, Part I: Does OT Actually Increase Trusting Behavior?